Tsar Nicholas II was the ruler of all Russia. On July 17, 1918, he and his entire family were brutally murdered. This is hundred-year-old video footage of the crime scene. In December 1918, a photographic team of the U.S. Signal Corps led by Captain Howard Kingsmore arrived in Yekaterinburg, Russia, where they filmed inside the house where Tsar Nicholas II and his family was brutally murdered. Against all odds, we recently found Kingsmore’s personal story on this photographic assignment, as well as part of these historic films. The execution of the last Russian Tsar and his family hardly needs an introduction. After the Bolsheviks had taken over power the Romanov family was moved to a so-called ‘House of Special Purpose’ in Yekaterinburg. The Imperial family was kept in strict isolation within the walls of a sinister heavily guarded building that was surrounded by a palisade. The Bolsheviks initially wanted to put the Tsar on trial, but in the summer of 1918 anti-Communist forces were at the gates of Yekaterinburg, and the Reds feared their captives would fall into enemy hands. As a result, death to the Romanovs was declared. Tsar Nicholas II, his wife Tsarina Alexandra and their five children Olga, Tatiana, Maria, Anastasia, and Alexei were shot, bayoneted and clubbed to death on the night of 16-17 July 1918. Their bodies were disposed of in a most gruesome manner. Howard P. Kingsmore was the photographic officer of a U.S. Signal Corps camera team that recorded the operations of the American Expeditionary Army in Siberia. Born in 1886, Kingsmore started his photographic work for the Philadelphia Inquirer, covering the burial of President McKinley, the coal strikes of 1901-1902 and the 50th anniversary of the Civil War battle of Gettysburg. Around 1907 Kingsmore became chief photographer for the Philadelphia Evening Ledger. For this newspaper he covered the civil war in Mexico, as well as the Punitive Expedition by General Pershing into that country in 1916. When the United States entered World War I he applied for a commission in the U.S. Signal Corps as a photographic officer. He was commissioned as a Lieutenant in September 1917, appears to have made mostly training pictures while he was in America and in Augustus 1918 was promoted to Captain, when a photographic section was set up for the Siberian Expedition. After the First World War Kingsmore became a cameraman for Fox News. Kingsmore said he boarded a Red Cross freight train in Vladivostok in November 1918. The trip across Siberia took about nine weeks. The accommodation on the train was of a most primitive nature. The American cameramen traveled in box cars that were originally built for cattle. Arriving in Yekaterinburg, the cameramen found the city controlled by Czech forces. These had taken Yekaterinburg shortly after the Tsar and his family were murdered. Kingsmore was told the Romanovs were subjected to many indignities by the Communist soldiers who guarded them. It should be noted here that at the moment when Kingsmore and Tannura arrived in Yekaterinburg an official investigation was still being carried out on the mysterious disappearance of the Imperial family. As far as the Kremlin was concerned, they had simply vanished into thin air and the Communists denied any allegation they had killed the Romanovs. Kingsmore’s and Tannura’s pictures indicate this was a fabricated lie. 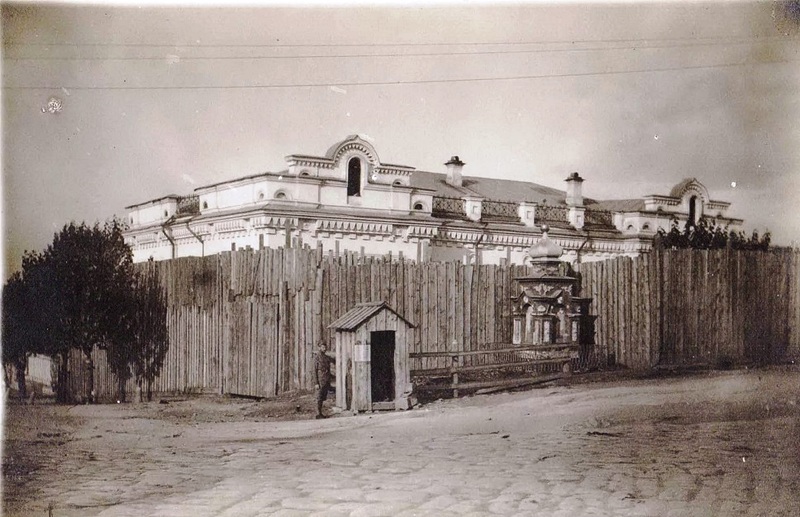 One of their still photographs shows the cellar where the Romanovs were executed. Bullets were dug out of the wall by the Bolsheviks to destroy evidence of the crime, but the holes still remained and were clearly visible. Their pictures also demonstrate how the Tsar’s children had to sleep on the floor, as well as the search by the investigating commitee for further proofs of the execution. Kingsmore also appears to have talked with eye witnesses. One told him the Romanovs were on their knees begging for mercy while they were executed in the basement of the house. Part of the footage that was shot at Yekaterinburg has been retrieved and identified by the authors in the film collection of the National Archives in Washington, D.C. These scenes were probably taken by Tannura and show an exterior of the Czech military headquarters, the house the Romanovs lived in, as well as shots of the Czarina’s room and the room that was occupied by the Tsar’s daughters. We edited these historic scenes into a short clip that has been posted on our YouTube channel.